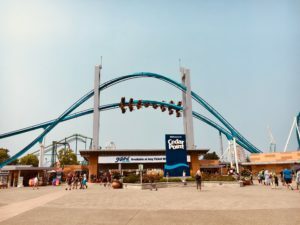 Sponsored post – Cedar Point hosted us. All opinions are my own. Cedar Point is an amusement park located on a peninsula in northern Ohio in the town of Sandusky. It’s known for its large, world-class collection of roller coasters, but there’s much more to Cedar Point than thrill rides. When we visited for the first time this August, we were expecting an amusement park, but frankly, we were amazed at the variety of activities to enjoy. 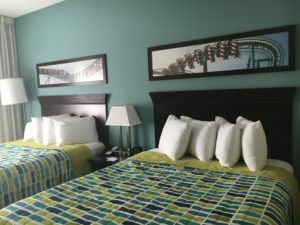 While the coasters are tall, fast, and downright incredible (Steel Vengeance is arguably the best roller coaster in the world), a trip to Cedar Point can also include relaxing on the beach, water sports, boating, fishing, shows, delicious food, and so much more. Steel Vengeance, the “new” roller coaster for 2018. New is in quotes, because the coaster actually already existed as a wooden coaster named Mean Streak. 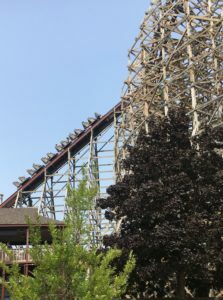 A company called RMC revamped the track using steel and creative genius, and now Cedar Point has yet another sought-after ride in their already stacked line-up of coasters. A relaxing day on the beach. The Point has the perfect mix of thrills and relaxation. 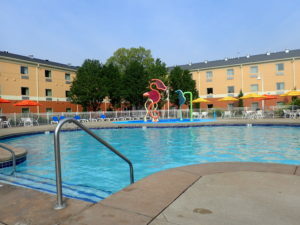 Spent a day at the park and now you’re looking to relax? Walk a few steps outside the park gates and you’ve transformed your adventurous vacation into a relaxing one. Parent swap done right. One parent waits in line, while the other plays with the kids! Enjoy watching your kids on the kiddie rides, while another adult in your party waits in line. 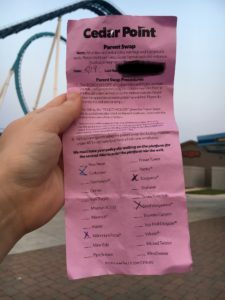 After they ride and hand the ride attendant their parent swap slip of paper, the other adult is able to go up the exit to the ride and get on right away. So much better than waiting in line with the kids! Cedar Point Nights add to the fun. 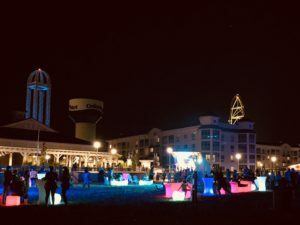 For select nights during the summer, after a fun day at the park, you can venture onto the beach to attend the silent disco, as well as check out the family fun zone, and the glow party! The kids loved it, and it’s amazing that everything is located in one place. Stay at the Hotel Breakers, and your hotel room is just steps away too! . History preserved. Cedar Point is the second oldest amusement park in the country, and the beautiful old buildings along the midway illustrate its history. Classic rides such as the carousel and Blue Streak roller coaster show that Cedar Point appreciates its roots, and be sure to check out Cedar Downs, a unique horse ride that is one of only two in the country. Shows and entertainment. 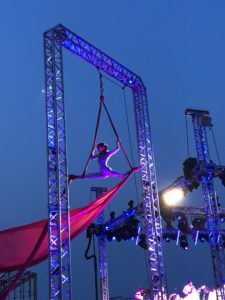 Cedar Point Nights includes a 12-piece band performing popular music with a fire performance and aerialist adding to the entertainment. As the nights get chillier this Fall, the frights will come out for some spooky fun! More thrills to be had with water. 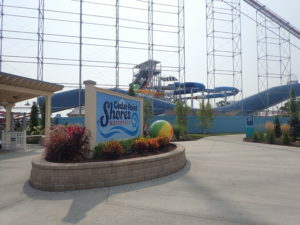 Cedar Point Shores, the outdoor water park also located on the peninsula, offers tube, mat, body and even drop slides for those who are very adventurous. In addition to water park, there’s water sports like jet skiing and parasailing, as well as boating and fishing available on the lake. Make friends with Snoopy. My youngest daughter has an obsession with Snoopy, and it’s not the easiest to find Snoopy clothing or toys nowadays. 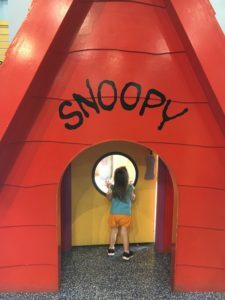 Fortunately, Cedar Point is full of Snoopy gear, has a themed kiddie area all about the Peanut gang, and we even got to meet them. End your fabulous day with a fireworks display. In the summer, Cedar Point Nights activities end with a bang. Fireworks are set off over the park, with the best viewing area being on the beach with your toes in the sand. The perfect ending to the perfect day at the Point. Coming soon! 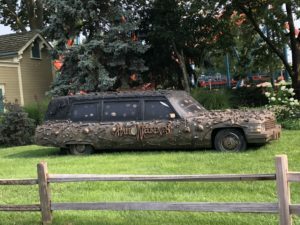 A post about Halloweekends at Cedar Point!